With fish safety paramount we are always on the look out for a quality affordable product. The triton thick deluxe oval padded cradle ticks all the boxes. 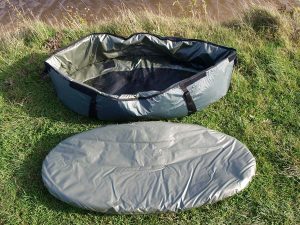 An extra thick padded walled mat with a fold over fish retainer means that the fish is always secure. The deep fill foam base sits in the well padded walled mat with excellent base drainage. Complete with velcro carry straps allowing it to become part of mobile carry system for stalking etc. A small accessories pouch allows your fish care kit to be close to hand. All in all a great addition to anyone’s kit and a great fish care solution that’s easily affordable. Triton Tackle is a fishing tackle design, supply and retail company. The company is owned and run by fisherman with a combined experience of over 100 years in the sport. We work with some of the countries most successful Carp fisherman when designing and testing our products at either of our two fisheries in Kent, UK.